The annual Independence Day party that I host at my California home was particularly alive with conversation this year -- conversation probably not too different from what was heard in a lot of backyards around the country. Folks are concerned that our nation is in bad shape and dangerously, maybe even hopelessly, adrift. The choreography was in place to assure a downbeat Independence Day party for a house filled with conservatives: a listless economy, coupled with the cold shower of the Supreme Court decision the previous week giving most of "Obamacare" a constitutional green light. To compound the injury, the dismally disappointing decision was written and handed down by a chief justice, an alleged conservative nominated by a Republican president. "Members of this court are vested with the authority to interpret the law; we possess neither the expertise nor the prerogative to make policy judgments. Those decisions are entrusted to our nation's leaders, who can be thrown out of office if the people disagree with them. It is not our job to protect the people from the consequences of their political choices." Maybe how Roberts interpreted the Constitution disappointed. But his point is indisputable: If you're looking for political leadership, "It's not our job." Conservatives are looking for leadership at this difficult and challenging time. Maybe because this July 4 crowd at my home consisted of many longtime Southern Californians, there was talk about Ronald Reagan. Yes, Jimmy Carter was bad. But Reagan did not just run against a bad economy and a confused, uninspiring president. He understood and believed in America -- and he ran on this vision. This is leadership. It happens that last month marked the 25th anniversary of Reagan's famous "tear down this wall" speech in Berlin. Its author, Peter Robinson, recalled the event in a Wall Street Journal column. The story has been told many times. But it cannot be recalled too many times that the political professionals -- the president's advisers and various members of the president's staff -- opposed including the "tear down" line. Despite numerous attempts to remove the line from the speech, it stayed in -- because of Reagan. The problems we have today did not start four years ago. They are the accumulation of many years of a slow but consistent departure from our core principles of being a free nation, under God. Of our now almost $15.6 trillion in debt -- 100 percent of our gross domestic product -- nearly $5 trillion was added over the last four years. But $10 trillion -- almost two-thirds -- was added over the last 12 years. Forty percent of our $4 trillion federal budget consists of inefficient entitlement programs tilting into bankruptcy. These are old and outdated programs: Social Security going back to the 1930s, Medicare and Medicaid to the 1960s. Our public school systems hold 60 million children captive by teachers unions dedicated to left-wing ideas and moral relativism. The traditional American family is becoming a relic of history. Out-of-wedlock births and the use of abortion as birth control have become fixtures of our society. 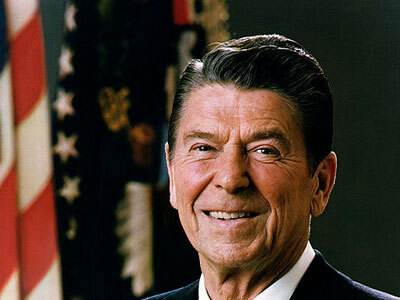 When Reagan ran for president in 1980, health-care expenditures consumed 9 percent of our GDP. Today, they consume 18 percent. We have a health-care problem with or without John Roberts' unpopular decision. Real recovery is impossible now without inspired leadership dedicated to recapturing the principles of limited government, individual freedom and the traditional values that made America great. The left has a leader. He is in the White House and he is leading us into oblivion. Where is conservative leadership -- leadership that will remind us that American community is defined by personal responsibility, not by government mandates?